Without mentioning the team name, I’m just going to throw out some facts. The quarterback has a TD to interception ratio of better than 3 to 1. The running back has accounted for over 2,400 yards the last 2 seasons and scored 17 touchdowns. The starting receivers both have 1,000-yard seasons on their respective résumés. What about the defense, you say? One of the top pass rushers in the game anchors the line, with a Super Bowl winning linebacker behind him and two first-round draft picks roaming the secondary. Sound like a team that can win? Let me add this. Of the other three teams in the division, two of them have quarterbacks who couldn’t break the top 20 in QBR last year. Brace yourself: the team is the Cleveland Browns. If you remove the uniforms, the depressed fan base, the 1-31 coach with a confused look on his face, and all the ghosts, you’re left with …a chance. That’s all I’m saying. There’s a chance. Which is why Baker Mayfield shouldn’t play this year, unless the Browns have been eliminated from playoff contention. That coach with the confused look is Hue Jackson, and he’s already saying Tyrod Taylor will be his starter, but they always say that. Every summer, the coaches of the teams that just grabbed a first-round signal caller say the rookie is going to start on the bench. Wentz ended up starting Week 1, and didn’t miss a snap until a year and a half later when his ACL forced him out of an MVP-caliber season. Savage lasted 2 quarters before being replaced, likely for the next decade at least, by Deshaun Watson. But the answer is no, at least until the playoffs are out of the question. I know, you think the playoffs are already out of the question. They aren’t. The Redskins won the NFC East that year. I know. We think we know what’s going to happen this year in the NFL. Pats, Steelers, Eagles, Saints, blah blah blah. We’re going to be right on some, and we’re definitely going to be wrong on some. If we remove the uniforms, the city, and the history from the Browns, we’re left with something that is believable. They have a real quarterback in Tyrod Taylor for the first time in what feels like forever. He’s 28 years old and heading into a contract year, which is a recipe for a breakout season. His only problem is that games won’t be the only thing he’s trying to win. He’s also trying to win the locker room, fan support, and trust from his staff. That brings us to Mr. Mayfield. He won’t be an easy person to hold off. In addition to being the first overall pick, his résumé includes a Heisman trophy, a lot of winning, and enough confidence to fill the Gatorade bucket he hopes to dump on a coach one day. And despite his police video, he’s smart. The small sign he put above the door in his now famous, re-enacted Brett Favre ‘night before the draft’ picture read, “Love my Cavs.” He’s playing to the Cleveland masses already. But some time on the pine for Mayfield is not only the right football move to start the year, it also would be good for him. Think of who Baker Mayfield is. He’s the guy who keeps getting told no, only to burst out and prove the doubters wrong. Mayfield didn’t get a scholarship. He walked on at Texas Tech, then started. When that didn’t work out, he transferred to Oklahoma, where he had to win a job again, and did. Two years and change later, he was on the stage at the Downtown Athletic Club in New York. He’s a guy who succeeds at a very high level, when he’s first told no. 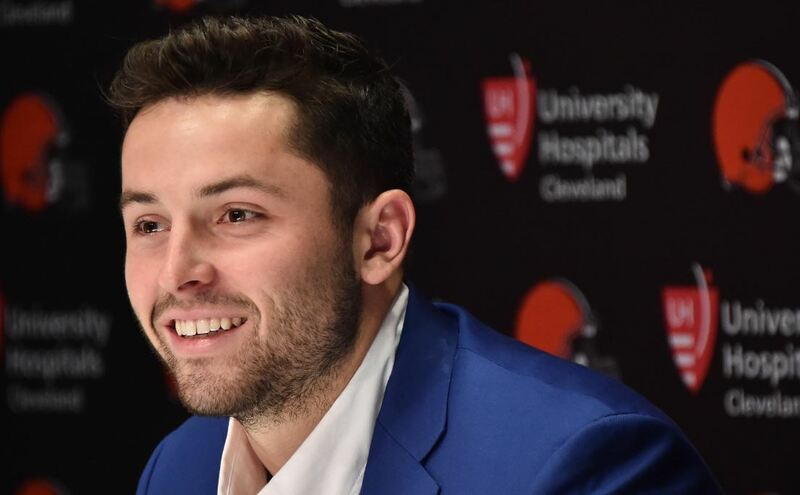 Being the number one overall pick is an intense role reversal for Mayfield – one that shouldn’t be taken lightly. As opposed to being told no, Mayfield is being thrust into the world of massive expectations. It’s easy to get fired up and perform when scholarship letters don’t show up in the mailbox. It’s not as easy when a team forks over $33 million and a playbook tailored to your talents. If Halloween rolls around and Browns fans are wearing bags over their heads to protect their eyes from a 1-7 record, then clearly, it’s time. But early games against the Jets, Ravens, Bucs and Raiders suggest something different is possible. 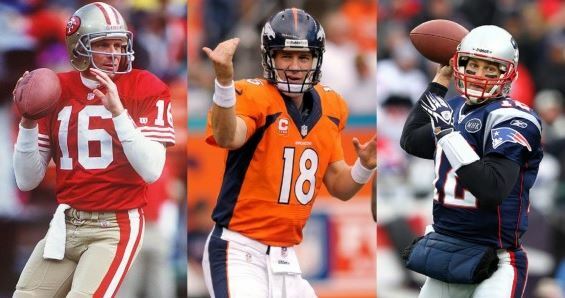 Both quarterbacks will be at their best if Taylor is the choice for an extended period. Taylor will be motivated to prove he deserves a big contract, somewhere, in 2019. Mayfield will be motivated by holding a clipboard and, once again, being told he’s second best. My parents used to ask me if I wanted to open one present on Christmas Eve. I always said no. I’d rather wait and have more on Christmas morning, I’d tell them. There’s something beautiful about a wrapped gift that sits under the tree for some time. Wildly ripping the paper off as soon as possible suggests you might be more interested in opening the gift, than enjoying what’s inside.